I'm a notorious over-packer when I have a large luggage allowance...but when I'm restricted to carry on only, I'm pretty great at planning outfits to make the most of the small weight and space. 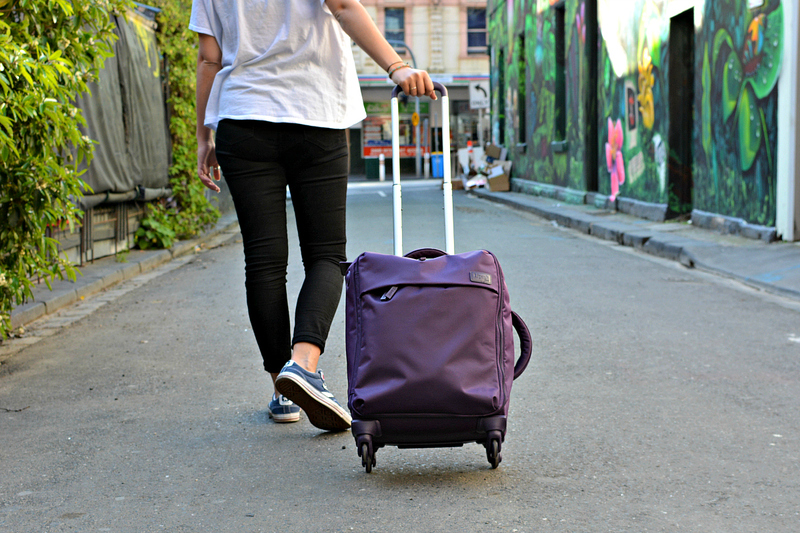 I usually take my Lipault Originale Plume Cabin Suitcase when I'm travelling carry-on only, but if I'm just going on 24 hour, overnight trip, then I take a holdall (my Country Road one is my fave) as I don't take much with me. As well as my suitcase or holdall, I also take my rucksack, or if I'm flying Easyjet who don't allow a second 'personal' item, I use this handbag and put it inside my cabin suitcase. My tips and what I pack are what works best for me, obviously you might want to adapt them depending on the type of clothing you tend to pack. Also I only travel with just hand luggage for a weekend or 3 nights maximum, any longer than that and I purchase additional luggage or fly with an airline that gives you free hold baggage. And remember to take a travel adapter with you if you're travelling overseas! You can see the best lightweight carry on bags here, I personally use the Lipault Originale Plume (£169) which I love! There are even lighter ones than that though - just remember, the lighter the bag, the more you can fit in it! I mix and match my clothes a lot when I'm travelling carry on only. I always travel in my black jeans as they're heavy, and then I can wear them during the day and for nights out to bars and clubs as well. For example by day I might wear black jeans with a t-shirt or jumper, and then by night I can wear them with a cute silky top. I have *a lot* of toiletries in my bathroom and bedroom, but when I travel I'm really strict with myself about what I take. I just take the bare essentials and then if I ever forget anything or really need something I didn't bring with me, I just buy it at the destination! Also make sure you don't pack shampoo, soap, or body wash - every hotel gives them to you for free so why take your own and use up vital space and weight? I do always take my own conditioner though as hotel conditioners are never good enough for my hair type. Always wear your heaviest clothing on the plane. I tend to travel in black jeans, and then wear a plain white t-shirt and light jumper with them on the plane. I also almost always take a coat or light jacket, a scarf, and then I wear trainers or boots. Do you really need your laptop just for 2-3 days? No. The work can wait, put your out of office on and leave it at home and make the most of being somewhere different! If you really have to answer emails, use your phone. Ladies, always opt for dresses over shorts and skirts as they're lighter and take up less space. If it's winter take a good pair of black tights/stockings with you. I'm always guilty of doing this when I have 30kg to play with, but with just 7kg when I'm travelling hand luggage only, I'm very strict with what I take. Never take anything 'just in case'. Check the weather forecast for your destination before you travel and plan your outfits in advance. I only take one lens with me when I travel on short trips - my 35mm prime lens. It's a good all-rounder and is the one that stays on my camera the most. I have my nifty little Lumix GF8 for wide-angle shots if I want them (my Lumix is less than half the weight of my wide angle Nikon lens). You don't need every item of make-up you own. I stick to the bare minimum; concealer, foundation, pencil eyeliner, liquid eyeliner, my small travel Smashbox eyeshadow palette, mascara, powder, and blusher. Leave the primer, highlighter, Naked palette, and contouring kit behind, you really don't need them for such a short trip. Avoid packing multiple different pairs of jeans, and multiple jackets etc. Stick to a classic and simple 'capsule' travel wardrobe so you look stylish but without having to pack loads of heavy clothing. 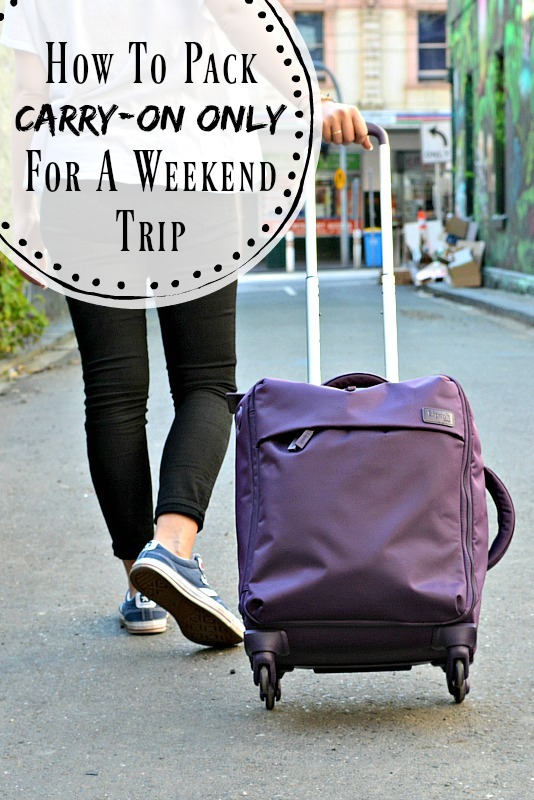 Definitely need to take on board these tips for my next weekend travel! The hardest part would be the toiletries part though! But I agree, the 35mm is such a versatile lens! I'm definitely in need of tips on how to improve my packing. I always take way too much kit with me!